PanARMENIAN.Net - In celebration of 110th anniversary of Pulitzer Prize and Academy Award winner William Saroyan’s birth, the Los Angeles Central Library presents the exhibit “My Name is Aram”, on view through October 7 and a performance of his unpublished works to be held on Saturday, September 15, Asbarez reports. The exhibit features 45 images as well as quotes highlighting the life of Saroyan, a Pulitzer Prize and Academy Award winning author, playwright, storyteller, maverick and humanist, said Ani Boyadjian, exhibit curator and manager of the Los Angeles Public Library’s Research and Special Collections. 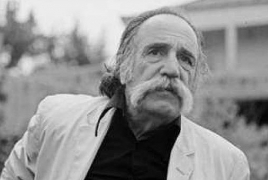 The exhibit features photographs of Saroyan, taken primarily during two visits to Armenia in 1976 and 1978 by photographer Boghos Boghossian. The quotes highlighted in the exhibit were taken from published works from Saroyan’s six decades as a master of dialogue and the written word. Some of his most acclaimed works center on issues of his Armenian ethnicity and diasporan identity, which raise profound questions about humanity’s universal pain and the paradox of exile. Special thanks to Varoujan Der Simonian of the Armenian Museum of Fresno for granting permission for use of the images used in the exhibition, and to Los Angeles City Councilmember Paul Krekorian and his wife Tamar for their steadfast support of both the exhibit and the performance. A recipient of the nation’s highest honor for library service—the National Medal from the Institute of Museum and Library Services, the Los Angeles Public Library serves the largest and most diverse urban population of any library in the nation. Its Central Library, 72 branch libraries, collection of more than 6 million books, state-of-theart technology accessible at www.lapl.org, and more than 18,000 public programs a year provide everyone with free and easy access to information and the opportunity for life-long learning. Syrian army eliminates fleeing IS fighters in eastern Deir ez-Zor The Syrian army opened fire on the fleeing IS fighters, killing and wounding most of them before they could reach a safe area.